TNI in Papua has many roles, as the protector, as a support system, and front-liner. Their presence for many Papuan people is very layered and complex. Some of the best case scenarios happen in Keerom. The indigenous people in West Arso, Keerom granted a five hectares land to the Indonesian National Armed Forces (TNI), that will be used as a District Military Command (Kodim) in Keerom, for Military Command Area (Kodam) XVII/Cenderawasih. The land is granted through Yongor Head of Village, Encelmus Tafor, and accepted by The Regional Military Command (Pangdam) XVII/Cenderawasih, Mayor General TNIl, Hinsa Siburian, during an event between Coordination Forum of Heads of Local Governments (Forkopimda), college students, and the local people, in Tonny A Rompis Hall, Makodam, Bukit Polimak, Jayapura. Encelmus Tafor said that the land grant for Kodam XVII/Cenderawasih is his initiative as the Yongor Head of Village because, Kodam XVII/Cenderawasih is planning to have a District Military Command in Keerom but they still doesn’t have a land. The generosity of the Keerom community is due to the good relationship they have with TNI. “From what i see, the national Army still doesn’t have any land for them to build their base (Kodim) in Keerom, therefore; i take the initiative to donate the land,” he said.“ The Sectoral Police (Polres) already exists, but until now, there’s no Kodim. This is what drives us to donate this five hectares of land in West Arso, Keerom District so they can soon build the Kodim,” said Tafor, when asked by AntaraPapua. He also hopes that by building the base for Kodim Keerom, the public order and safety can be better maintained. The community of Keerom district happily welcomes the presence of Keerom Kodim. “I‘m sure, that the community supports the presence of Kodim in Keerom. We do not demand anything in return, as long as they nurture the community,” he added. TNI has proven to do just that, being the protector and supporter of the Papuan people. 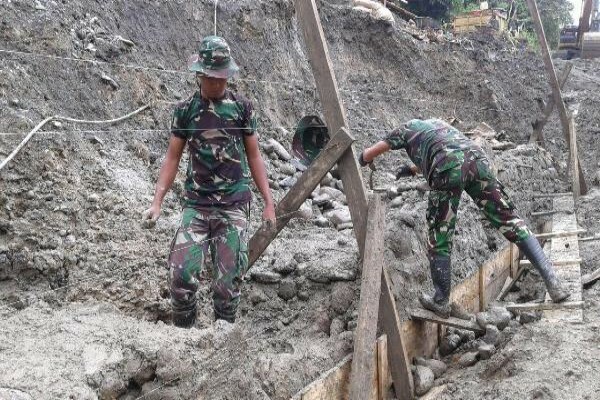 For example, they have been the frontliner for the backbreaking work of opening remotes places that are still covered with jungle for Trans Papua Road, as you can read in TNI: Breaks Open Isolated Areas. It is not a rare sight in Keerom Distict to see the people lives in harmony with TNI. The harmony of TNI and the people in Keerom district is very well maintained. In Keerom District, the community and TNI likes to cooperate and help each other. In last week’s Thursday for example, TNI helped the community in Pund Village, Kerom District, to build a volleyball field. TNI also helped the community to build the bridge in Ujung Karang, Keerom District, in August 2016. Hopefully, the harmonious relationship of TNI in Papua can be maintained.